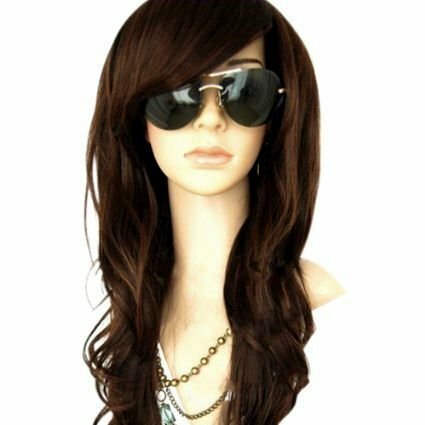 MelodySusie Dark Brown Curly Wig - 34"Curly Wig with Inclined Bangs Synthetic Cosplay Daily Party Wig for Women Natural as Real Hair (Dark Brown) | What Should I Say? MelodySusie - Bring Your Beauty Salon Home! MelodySusie Wigs - New Wigs, New Feelings, New You! MelodySusie wig adopted 100% Matt high temperature fiber from South Korea, which is often known as Japanese silk. It is the best fiber material for wig. Its physical properties, appearance, color and texture are highly similar to real hair, look just like real hair. The wave and curls of the hair are specially designed to look completely natural. The internal is used with 100% breathable rose net. Two adjustment straps can be intertwined to a fixed position, and can be adjusted to different head sizes. It's very easy to wear. All hair is well-designed, combining with TONI&GUY's street fashion concept, so the layers, hairline and curls altogether generate a vivid and fashionable looking wig. 1) Do not use heated styling tools such as curling irons, flat irons or hot rollers on your wig. 2) Do not brush your wig when wet. Can I cut my wig? Your wig comes with a basic style, but it can be cut and shaped by a professional hair stylist to customize the look. This is a great way to make the wig uniquely your own. Often, a little trim on the bangs and a little thinning here or there can make all the difference. Only buy it from MelodySusie Direct to get authentic quality product and to qualify for full after-sale service. If you have any questions about this product by MelodySusie, contact us by completing and submitting the form below. If you are looking for a specif part number, please include it with your message.